China is the world’s most populous country and the largest energy consumer in the world. 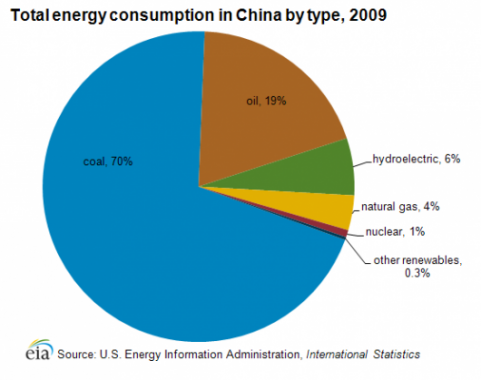 Rapidly increasing energy demand has made China extremely influential in world energy markets. China, today, is the world’s second-largest consumer of oil behind the United States, and the second-largest net importer of oil as of 2009. At the same time, China’s largest oil fields are mature and production has peaked, leading companies to focus on developing largely untapped reserves in the western interior provinces and offshore fields. Although natural gas use is rapidly increasing in China, the fuel comprised less than 4 percent of the country’s total primary energy consumption in 2009. The Chinese government has made the expansion of natural gas-fired and renewable power plants as well as electricity transmission a priority. The Three Gorges Dam hydroelectric facility, the largest hydroelectric project in the world, started operations in 2003 and completed construction in 2012. • NOCs (National Oil Companies) are going to invest more in Enhanced Oil Recovery (EOR) techniques. • In order to secure and diversify energy supply, and to develop technical expertise in unconventional resources, Chinese NOCs are expected to invest in international projects and form strategic commercial partnerships with IOCs (International Oil Companies). It is particularly expected to increase investments in Middle East, Africa, Latin America, North America and Asia. • The hunger for oil will be the cause for conflict and for increasing Territorial disputes in the East China Sea (China-Japan) and in the South China Sea (especially China-Vietnam). Check the recent developments between Japan and China. • Nuclear Energy 1: China is currently a moderate nuclear energy producer but China’s government plans to boost nuclear capacity to at least 70 GW by 2020.